Stupid is as stupid does. Forest Gump, a fly fisher, said that. At least we assume Gump was a fly fisher, because fly fishers can do a lot of stupid stuff. Well, at least my podcast partner, Dave, and I can. We’ve had a few forgettable fly rod moments. Here is a list of some of our worst fly rod moments. We’ve discussed these in various episodes. 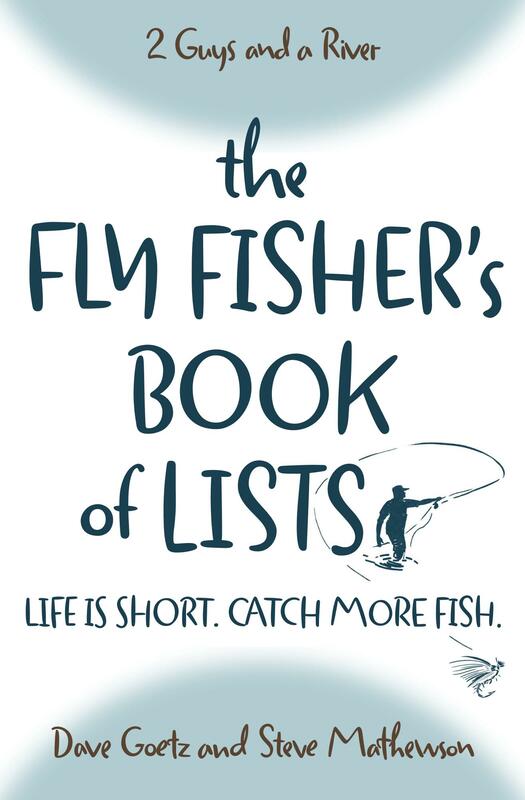 But perhaps a list of them can function as a public service announcement to be more careful with that expensive instrument without which you cannot fly fish. Dave and I were hiking into Fan Creek in Yellowstone National Park when we stopped to share the narrow trail with some approaching hikers. At that moment, I noticed my fly rod was not in my hand. I thought I dropped it, then realized I left it on the top of our SUV in the parking lot! I hiked out a half mile and retrieved it (thankfully, it was still there). Meanwhile, Dave waited patiently (I think) while a fly fisher passed us and took the very spot we were hoping to fish. One spring, we were fishing between Quake Lake and Hebgen Lake on Montana’s Madison River. Halfway back to my house near Belgrade, Montana, Dave realized he forgot to take his fly rod off the top of my Toyota truck and put it in the cab. I pulled into a turnout, and we checked the roof. But the rod was long gone. Yet every cloud has its silver lining. The rod Dave lost was a cheaper one, forcing him to buy a higher end rod. Do you suppose that Dave intentionally … ? Unfortunately, I didn’t have the sense to turn on the light when I walked into our “mud room” (as Montanans call it) to grab something from my fly tying bench. As I approached the bench, I felt something under my shoe and then heard a sickening crack. I shuddered as I remembered that I left my fly rod leaning against my bench to dry off after an afternoon of fishing. Thankfully, the Orvis rod guarantee covers those “stupid is as stupid does” moments, and I got it fixed for a minimal fee. What one does, the other does. Awhile after I broke my Orvis rod, Dave broke his (yes, the one he purchased after losing the first one off the top of my truck). We were scrambling up a cliff above the Yellowstone River in Yellowstone National Park when Dave snapped the tip off of his rod on some brush. I have to say that he did a pretty good job the rest of the day casting hoppers without a rod tip. In fact, he caught so many cutthroat trout that I suggested he always break off his rod tip for good luck on our way to river. Sadly, Dave hasn’t embraced my suggestion. But this one was, well, plain stupid. My son, Luke, and I had just finished a good day on the Owyhee River — an excellent tailwater in eastern Oregon. As Luke waded towards me from the opposite bank, I began taking fly rod apart to put it back in its rod tube. Suddenly, the top half of the fly rod slipped through my fingers and into the river. No worries, though. The run below the bank was only three feet deep, and surely the rod tip would float. To make a longer search story short, we never found it — even after Luke went into scuba diving mode without a mask or tank. Once again, Orvis came to my rescue! They honored their rod guarantee and replaced the tip section (actually, it appeared to be a brand new rod). Alert readers will notice a break in the pattern. Dave didn’t do anything as stupid as losing part of his fly rod in the river. No, he only snapped in half a guide’s brand new Orvis H2 (their most expensive rod at the time). In defense of Dave, he had reeled in a large rainbow to the boat when we were fishing the Lower Madison River. As the guide lowered his net, the trout suddenly darted under the boat. Before Dave could react, the rod snapped in two as the trout bent it over the boat’s starboard sidewall. The guide coughed slightly, turning his head for a moment, and then proceeded to act as it was all part of a wonderful day on the river. This would not be a public service announcement without identifying a few lessons we’ve learned about protecting our fly rods. Ready? Turn on the light and watch your step when you are in fly rod country. Step away from the river when you disassemble your fly rod. And, for goodness sake, don’t let a trout dart under your drift boat. Or, to be on the safe side, don’t ask to try out the guide’s newest, most expensive fly rod. Better to be on the safe side than to be stupid. Oh I have had plenty of heart sinking moments when it comes to being stupid with my fly rods . One time I was trying to get out of a sudden thunderstorm. Ran to my truck rod in hand . I thought my rod was clear but unfortunately in my mad hurry to take cover I slammed the rod with the door. Thank God for life time guarantee. Same rod several months later casting a bead head nymph middle of winter one bad cast smack right in the tip . That sound no fly fisherman wants to hear . Worst yet watching the tip sliding down the fly line into the water. A few dollars for shipping once again my guarantee saved the day . Same rod one year later . While making a tight cast among overhanging limbs I came back to far snap there went the tip . I retired that rod . Then a few weeks ago I was walking back to the truck while trying to take my fly off the tippet something I now look back on and say what the heck was I thinking. My fly line had just enough slack in it to catch a rock and instantly broke the very tip of my pride and joy 2 wt one piece bamboo rod. Thankfully I have a close friend who was able to repair my precious bamboo minus a half inch in length. So yes stupid as stupid gets. Aah, I feel your pain–especially about the bamboo rod. What a sickening feeling. It’s great you have a friend who was able to repair it. I suppose we can take comfort that we’re not the only members of the “fly rod stupidity fraternity” … Lol! And yes, I’m thankful for lifetime rod guarantees.